Baylor>Department of Religion>Our Faculty>Faculty>Eric Holleyman, Ph.D. Between first and second grade Eric Holleyman moved with his family from Texas to Florida. After high school he left Florida to enroll at Mississippi College. While in Mississippi he was challenged to consider a call to ministry and to continue his education at New Orleans Baptist Theological Seminary. While in seminary he was offered the opportunity to return to the college life in the role of a campus chaplain. Subsequently he spent six years as a chaplain for two different Baptist colleges. He left the college campus experience to join a church staff in Alabama. In that ministry setting he felt the need for more education in order to prepare for service in the local church. Therefore he returned to New Orleans to pursue a doctorate in pastoral ministry. Between 1989 and 2002 Eric served as a pastor of three churches; one in Louisiana, one in Florida and one in Texas. 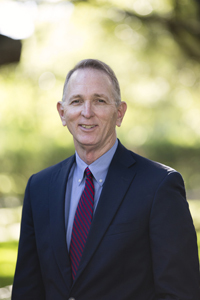 As a senior pastor in the Waco area for six years he had the opportunity to teach as an adjunct for the University of Mary Hardin-Baylor and for Baylor University. Earlier when he left campus ministry Clara, his wife, had predicted that he would one day return to the college scene. In 2002 her prediction came true when he accepted an invitation from Baylor to join the Department of Religion on a fulltime bases in order to teach Christian Scriptures. Since that return Eric has expanded his contributions to the department by teaching in the Ministry Guidance area and mentoring doctoral students who teach as adjuncts. He also has invested in the life of the university by partnering with student life in numerous initiatives intended to enhance undergraduate academic success.